Have you typed “HGV training Devon” into your search engine because you are looking for an established provider that will get you licenced in no time in a welcoming learning environment? If that sounds like your current situation, then you have struck gold by discovering Wayside Transport today. To find out more about our methodology and availability, please give our customer care team a call at your earliest convenience on 01202 873 911. At Wayside Transport, we are happy to announce that our first time pass rate is 25% higher than the national average. This means that you are greatly increasing you chances of success when you enlist us for your HGV training, Devon. 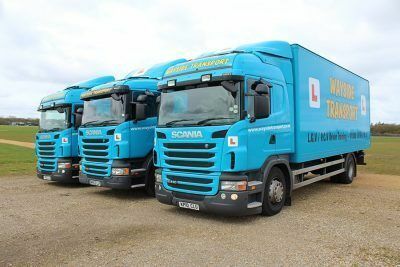 Our driver training is very comprehensive and will cover absolutely everything that you will require to be a successful HGV driver. Our HGV training Devon residents have come to know and love is aimed at people who took their car test after 1997 and are now looking to drive vehicles over 3,500 kilograms. Once you finish our course, you can expect to earn up to £30k a year. All of our instructors are fully qualified professionals who have a great dedication to what they do. Information will always be relayed to you in a manner that is easily understandable and down to earth. On top of the comprehensive theory, you will also get ample practice behind the wheel that enables us to accurately assess your natural skills and driving habits. Regardless of whether you are a single individual looking to expand your earning potential and job opportunities or the representative of a company looking to qualify several drivers in one go, you have come to the right place. Wayside Transport will customise every HGV training, Devon package to your specific requirements. To get a better overview of our fleet and the premises where you will be undertaking your HGV training in Devon, check out the gallery section of our website. Our fleet is fully maintained and will provide the perfect learning environment for you. Reasons to choose the Wayside Transport? For organisations, Wayside Transport delivers high quality Devon HGV training that will produce highly responsible and skilled drivers for your company. The innovative approach that we take will ensure that all of your new drivers are safe and legal road users who will be a great asset to your organisation. Our HGV training can occasionally also take place at your business premises should that be the most convenient option for you. Get in touch with our friendly team to find out more about this option and we will discuss availability with you. Even if you are based outside Devon, reach out because we will always go the extra mile to facilitate a customer request. Individuals looking through the websites of various HGV training Devon providers will already know that heavy goods drivers are always in demand. Our company will help you take those first steps towards getting licenced, expanding your job opportunities and greatly improving your earning potential and thereby your quality of life. As you will be able to tell from all of the above information, there is no other company offering a HGV training Devon service that can compete with everything that Wayside Transport brings to the table. Should you have any more questions about any of our services, then please do not hesitate to reach out using one of the handy contact methods that have been outlined for your benefit below. If you are now convinced beyond a shadow of a doubt that no other company advertising “the best HGV training Devon can offer” will match what Wayside Transport brings to the table, then contact us. You are more than welcome to either call us directly on 01202 873 911, e-mail your requirements right on over to simon@waysidetransport.co.uk or fill out our simple online request form – we won’t leave you waiting.